It was meant to be a Victoria sponge – that classic British vanilla cake that is sandwiched with jam and whipped cream. But a few minutes after my sponge cake batter went into the oven, the electricity once again went off. I watched helplessly as my cake — which was happily swelling with pride — sank like a punctured balloon. I took the cake out of the oven – it wasn’t bad, just sunk, making it unpresentable in its current avatar. Usually, I would have cut it up into pieces and no one would have been the wiser. But I had to take the cake for a Harry Potter-themed party the next day, and now I had no dessert. Disaster with a capital D.
After I hopped around my house, shaking my fist at the electricity board for a while, I calmed down enough to head to Bakerella’s website for her cake pop tips. Bakerella, aka Angie Dudley, made these delectable desserts famous with some of her innovative decoration ideas. Cake balls are basically cake mixed with frosting and rolled into balls and dipped into a chocolate or candy coating. Add a skewer to it, and it becomes a cake pop. Ice spooky eyes onto them and they become Halloween treats, or ice on a pair of spectacles and a scar and they become perfect for a Potter party. Cake pops are so much fun.I didn’t have skewers or toothpicks – it was just one of those days! So, I rummaged through my baking cupboard and found a box of hagelslag, Dutch chocolate sprinkles. I rolled half the the cake balls onto the sprinkles (you can get kids to help), and happily dubbed the creation Cockroach Clusters. In case you are wondering, that’s straight out of a Harry Potter book. The other half I refrigerated and served cold. The fabulous thing about these pops is the versatility. You can dip them into white chocolate or dark, use candy melts to coat them, ice them or leave them plain, use chocolate or vanilla cake. It doesn’t matter. They are still perfectly gobble-able. As one of the teenagers at the party told me, “These are the best chocolate whatevers’ I have ever had.” I will take that as high praise. Method * Crumble the cake with your fingers into a mixing bowl. Work slowly until you have even, fine crumbs. You can use a food processor if you like. You can cut off the crust of the cake if it’s too hard, but honestly, it crumbles fine, unless it’s a burnt cake. Prepare the frosting * Using a hand blender or stand mixer, beat the butter until very smooth. You can do this by hand, but it takes ages. * Add the vanilla extract. * Reduce the speed of the mixer and add sugar, a little at a time. Sifting the sugar in advance means there will be no lumps. * Beat for 5 minutes until the mixture is light and fluffy. You can add some milk if you need to give it a slightly softer consistency. * Spoon in the frosting, a little at a time, into the cake crumble. * Keep mixing until you can shape the dough into balls that will hold their shape. If you add all of the frosting at once, it will become soggy. Instead, add little at a time and the rest you can save for frosting the cake pops if you wish. * Shape the dough into ping-pong sized balls. I made two sizes, one small and the other slightly larger so that they could become hefty cockroach clusters. * Place the cake balls on a shallow tin, lined with baking paper. Cover with cling wrap and refrigerate for at least an hour. Two hours is better. This ensures that the balls retain their shape. (Note: At this point the cake balls can be frozen for later use. But if you plan to make them a day or a few hours in advance, then avoid freezing them as they may crack.) * On a double boiler — put a pan with water to boil and place a thick-bottomed pan on top of it in such a way that it doesn’t touch the water – melt the chocolate along with the butter. Be very careful at this stage. Overheat the chocolate and it will harden unattractively. What I do is when the chocolate has almost melted, I remove it from the heat and beat the rest of the lumps into the sauce. * Add a few drops of vanilla extract. * Transfer the chocolate to a deep bowl and cool slightly. * Meanwhile, remove the cake balls and let them thaw slightly. If you’re making cake pops, insert the skewers at this stage. Remember to insert them only halfway through. * Now, dip the cake balls into the chocolate. Don’t roll them or else they will get an uneven texture of the chocolate. Just turn them to get an even coating and let the extra chocolate drain off. Stick them onto the Styrofoam block or, like I saw someone do online, into the holes of the dhokla steamer. Basically, use something that will prop them up. 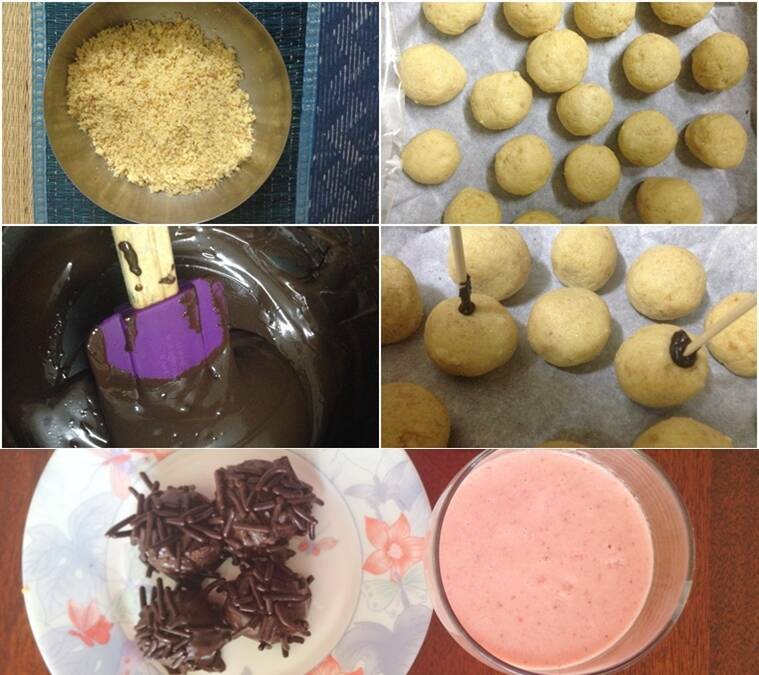 If you’re making cake balls, then use a spoon to dip them and place them on a baking paper. * If you plan to add sprinkles, now’s the time to roll the pops onto the sprinkles, while the chocolate is still wet. Once the chocolate hardens, you can keep them at room temperature or pop the extra ones into the refrigerator. I doubt you will have any leftovers.